Some old wounds take centuries to heal. 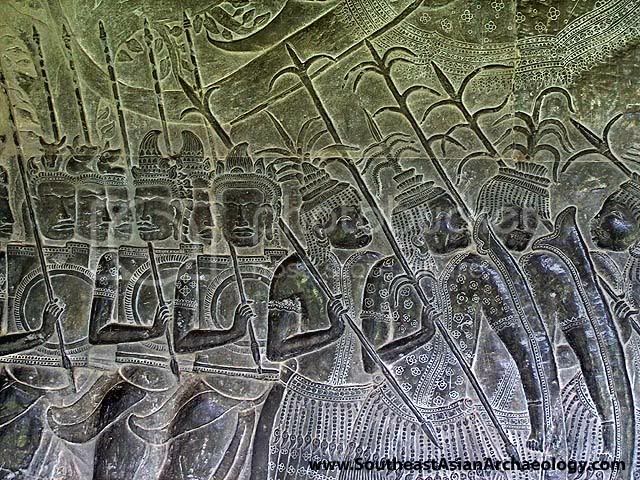 “Syam Kuk” refers to the bas-relief at Angkor Wat where the Khmer army and Thai mercenaries march eastward to fight the Chams from Vietnam, and they form the backdrop to the current tense relations between Thailand and Cambodia. This small incident shows that despite tireless efforts by both governments to heal the wounds, things might not necessarily be improving in the minds of the people. Siem Reap has just hit the record of receiving over two million tourists, mainly from China and South Korea. The history of the Khmer empire is being kept vivid for the Cambodians who are cashing in on their heritage. Not all Cambodian guides hold a grudge over the Thai-Cambodian historical conflict, however. Tarth Nu, regarded as Khru (master) by other tour guides, carefully explained the history of the Khmer and the Khmer heritage without naming specific invading nations that drove the Khmer from their ancient capitals of Angkor Wat and Angkor Thom, to the present Phnom Penh. Tarin Prom, a 34-year-old taxi driver in Phnom Penh, claimed that half of the Cambodians remained angry with Thai people and continued to hate them after the infamous torching of the Thai embassy. But he himself did not want any further trouble. Time has passed and the physical debris has been cleaned up. Hotels, restaurants and guesthouses that used to bear Thai names such as Chao Phraya, Thai or Siam, have gradually been changed to Khmer words such as Jayavaraman, or Angkor. The Thai embassy has been beautifully rebuilt and is now secured with two high-tech gates. The private Thai companies have been fully compensated, mostly in kind and through tax breaks. Yet, deep inside, the hurt is still there in the hearts of both Thais and Cambodians. Thibodi Buakamsri, a history lecturer at Kasetsart University, said among other efforts that could heal the ill feeling, a rewriting of the history textbooks might help, as many of them were filled with prejudice towards neighbouring countries. Intellectuals from both sides believe they should set things right for the future by making the contents of textbooks used in both countries’ formal curriculum ”decent and with a proper attitude” towards neighbours. It may sound simple but any revision would be an arduous task as it must change the core concept of each country’s national history. ”We might need to pay more attention and resources in shaping other approaches to viewing our neighbours, aside from the historical perspective. This should not be the burden of Thai people alone. Both sides should do something,” the academic said.